Patrick Symmes, in Pop Goes Peru, extols the dynamic changes taking place in the food culture of Peru. A cuisine that relies heavily on humble ingredients, and its multi-ethnic population, is making waves in the global food scene. That alone is enough to pique interest for this home cook, but the fact that my beautiful sister-in-law hails from Peru has had me wanting to learn more about Peruvian flavors for a decade. I’ve been working on Peruvian Chicken Stew with Corn (Estofado de Pollo con Mote Peruano) in my mind – and on my cooktop – for years. 🙂 The gigantic corn (mote) most definitely qualifies as a “humble” ingredient, yet it brings a unique flavor and texture to this stew. Mote is the Spanish word for several varieties of dried, soaked, and boiled corn that are a staple in many South American countries. In Peru, mote refers historically to peeled white corn kernels that have been boiled with charcoal or firewood, and today with calcium hydroxide (slaked lime) powder. In Cusco, Peru, there is a variety called giant corn mote of Cusco (maíz mote gigante del Cusco) that is known for its large size. 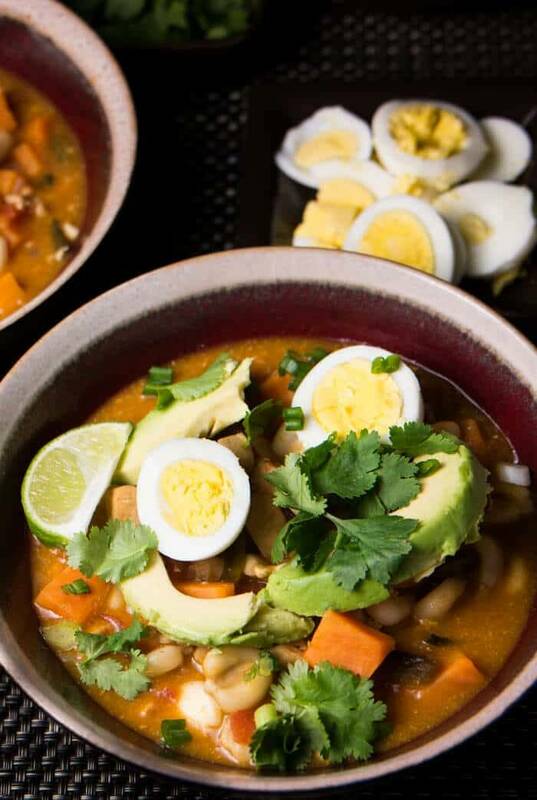 If you’ve followed my blog for any length of time, you know how I love posole, and feature it in many of my New Mexican recipes. 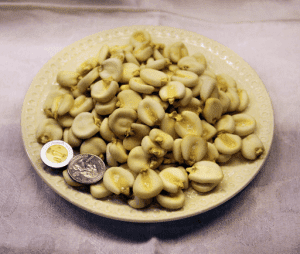 You can substitute posolé (hominy), but it isn’t quite the same texture and flavor. The chewy texture of the mote really makes this an interesting dish. I used Mote Pelado I found at Ruben’s in McAllen; Goya markets Maiz Mote Pelado (widely available in supermarkets and through Amazon). The very first step in preparing this dish is to get your corn cooked. Cook it according to the package instructions. My 15 ounce bag of Mote Pelado provided enough corn for 2 meals. Simply freeze the remainder after adding 2 1/2 cups (cooked) to the pot. Once the corn is cooked, the dish comes together quickly. That means the second time you make it, it’ll be a snap! Blacken the poblano chile (if using), and boil your eggs. Use a dutch oven or large sauce pan (I love my cast iron dutch oven for this). You will sauté the onions, garlic, chicken, sweet potatoes, and ground cumin, and then add the broth/stock, aji amarillo chile paste, tomatoes, and chopped poblano chile. While the stew simmers, prep the garnishes. 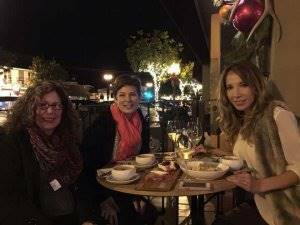 Sisters… Me, Corinne, and Josselin. So, how did I arrive at a name for this recipe? Well, my sister Josselin is an invaluable resource when it comes to the Spanish language and Peruvian food. She even got her mama involved. I want to “represent” their delicious cuisine well, and also keep it accessible to my readers. Referring back to my opening quote, Peruvian cuisine is finally experiencing its due in the United States, and I’m an enthusiastic ambassador. 😉 The ingredients are, for the most part affordable and available, and the Peruvian flavor profile offers a whole new adventure in eating. Have you had the pleasure of either cooking or eating the food of Peru? I would LOVE to hear your thoughts! If you've not already done so, get that mote cooked! You want it al dente - firm to the bite - not soft. Blacken that poblano chile (if using). Place the blackened chile in a paper bag or covered container to steam. Boil the eggs to hard cooked, but not overcooked! In a dutch oven, heat olive oil over medium high heat. Add garlic and onion. Saute 1 to 2 minutes. Add chicken. Saute until nearly cooked (edges beginning to brown). Add cubed sweet potatoes and chicken. Stir. Cook 5 minutes. Add flour, and cook until flour begins to brown and smell toasty - about 3 to 4 minutes. Add the aji amarillo paste*, broth/stock, and petite diced tomatoes. Stir well to combine. When mixture comes to a boil, cover and reduce heat. Cook until sweet potatoes and corn are tender but not soft. Meanwhile, finish preparing the garnishes - slice the egg and avocado, cut chop the cilantro and scallions, wedge the lime. Ladle the stew into bowls. Top with garnishes of choice. Enjoy! If you must, substitute hominy or posole. If you don't love the heat, substitute green bell pepper or an anaheim chile roasted. I must got shopping at Rubens, and then make this dish. 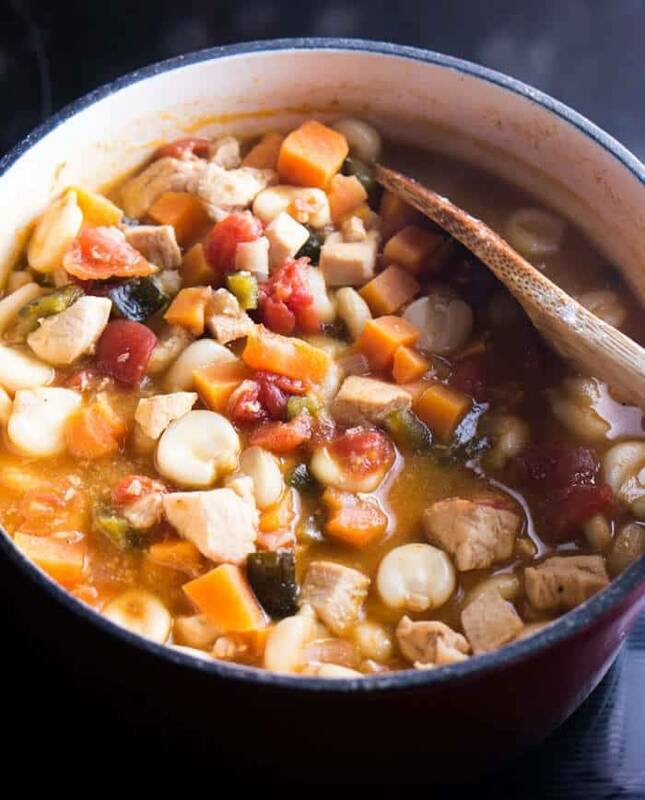 It looks like my kind of stew, ingredients we love in a great sounding combination. Thanks for sharing this one! this looks amazing! Perfect now that it's starting to get chilly out. I love Peruvian food! I've seen mote here in our Spanish grocery store, so I'll definitely give this recipe a try :) It looks delicious! I'm so glad you can get mote! I hope you do try it :-) Thanks for stopping by! This is awesome Tamara! I have never had Peruvian food and never had Mote either! I am so intrigued! I have to check out local stores for some because I now really want to try it! :D Plus it looks PERFECT for Winter! I hope you can find it Dini! :-) We moved to a subtropical climate (McAllen, TX. ), and I'm making those cold-weather dishes when I guess it's too warm, but I love soups and stews! Thanks for stopping by! Have only tried Peruvian food once and loved it! This looks so good for cold days! It would be amazing for a cold day! My husband and I recently moved to far south Texas, and we're still having daytime highs in the eighties. I just miss soups and stews, so I'm cooking them anyway :-) Thanks for stopping by! I love Peruvian food!! Your recipe is so simple and looks delicious!! I've never seen mote before, but your recipe sounds delicious! And I love your photos. Mote' looks like posole' on steroids. :) Thank you introducing this peruvian stew! Bobby bought me a great cookbook of recipes and ingredients of central and south American countries. Love learning about new ingredients and dishes. This one is a keeper. It looks so hearty and quite tasty. Always love eggs on top. Great picture of you and your sisters. Good description! It looks like a larger version of posole, but the taste and texture are slightly different. Thanks MJ! 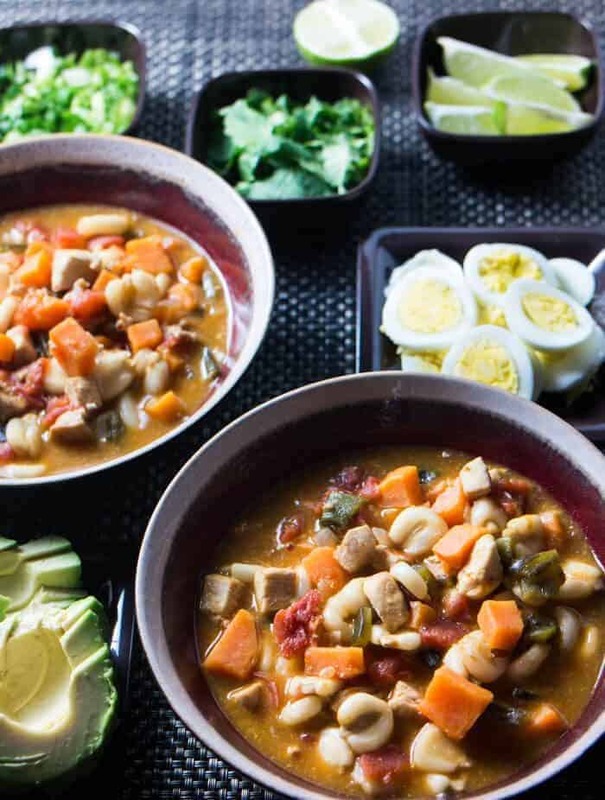 Have never seen mote sold before in stores but need to get my hands on it so I can make this delicious sounding Peruvian stew! If you have Goya products, you may find it there... Otherwise, try substituting hominy. It really is delicious! Thanks for stopping by!